When you need a cordless phone that has a longer range for a large property there are a lot of expensive solutions that require an inordinate number of repeaters to pass off the signal from various zones. Car lots and multi-floor offices are good examples of where this type of wireless phone is required. For more than a dozen years, Telephone Magic has offered the BEST and LEAST EXPENSIVE long range wireless phone solution that will cover most of these applications with an all-inclusive cordless phone with charger and an independent antenna base that can be mounted in an ideal coverage location. EnGenius produced the first industrial long range cordless phone and now, this latest version, the DuraFon 1X, is the first rugged industrial long range wireless phone. The EnGenius Durafon is an industrial long range cordless telephone with up to 5 miles (8 km) range in open terrain and up to 12 floors of penetration in office buildings. In warehouse environments, you can have up to 250,000 square feet of coverage. Outdoors on farms, ranches, car lots or college campuses, coverage is up to 3,000 acres. 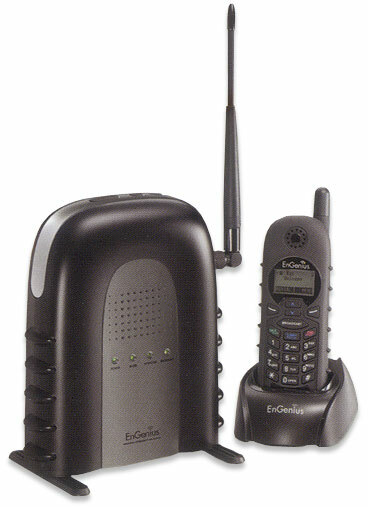 In addition to being a cordless telephone, the EnGenius DuraFon is also a full-duplex 2-way radio which operates independent of the base unit. This system will grow with your business, allowing you to add up to 9 handsets per base unit. You can expand the system up to 4 lines (4 base units are needed) and 36 handsets in total. The DuraFon works off any analog line and is also easy to add to your digital PBX with the EnGenius digital adapter (optional). Alternatively we also offer the EnGenius PRO 4-line long range wireless phone. Complete mobile communications: Using EnGenius, you can answer a call away from your desk. Is it for someone else? Just transfer the call to the proper extension. Or you can put the call on hold, and radio your colleague to let him/her know who’s on the line—from your cordless handset. Full duplex 2 way radio: Unlike the usual take turns conversations typical of radio or CB communication, the EnGenius 2 way radio works in full duplex mode. That means you can talk comfortably and naturally with a co-worker. And you can talk privately so you don’t have to worry about broadcasting your conversation to the entire warehouse. Exceptional Security: Digital spread spectrum technology broadcasts your conversation on up to 200 channels each second, preventing eavesdropping. Add up to 36 handsets: Each EnGenius base can support 9 handsets. Your system grows as you grow: Up to 4 bases and 36 handsets can be linked into one system. Long Talk Time : The EnGenius DuraFon handsets delivers up to 6 hours talk time, 50 hours standby. Each handset comes with a long life Lithium Ion battery. Call directory: With a 30 number speed dial, you can keep your important business contacts at your fingertips even when away from your desk. Headset capability: With the DuraFon’s integrated headset jack, you’ll be able to connect your favorite 2.5 mm headset for cord free, hands free conversations. Caller ID/call waiting: See who’s calling before you pick up—even on your call waiting call. Just check your handset’s 3 line LCD. Optional external antenna: Extend your coverage. Use the optionalexternal antenna and take your conversations outdoors and around your worksite. Every business site is different and in larger areas an external roof antenna can be added to extend the already impressive range of the EnGenius DuraFon 1X. You can easily connect this long range wireless phone to your business phone system via a single line analog port, which allows the DuraFon to be integrated as an extension of your telephone platform. There is also a multi-line version of the DuraFon, the DuraFon Pro, which allows up to 4 telephone lines to be handled by the system. Either way, we highly recommend the DuraFon for your long range cordless requirements as the BEST solution on the market today. As your EnGenius Elite Dealer, you know you are buying from a trusted source, which ensures you receive factory-direct warranty service for your DuraFon purchase. This entry was posted in analog, analog port, cordless, cordless phone, long range, long range wireless phones, multi-line, single line, wireless, wireless telephone on January 23, 2013 by jjackson.